A close examination of the fossilised mouthparts of these ancient parasites show that many of the earliest forms have long, piercing mouthparts resembling those seen in the Mecoptera, an order of winged, graceful insects . . . . . as a collection provides evidence that fleas readily took advantage of the food resources available from potential hosts such as the Dinosauria, early mammals and the Aves. 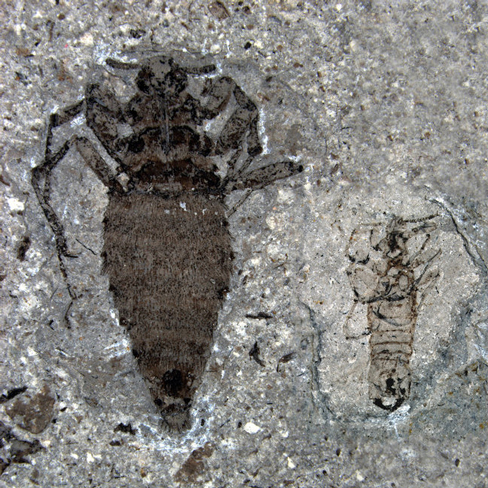 Fossils from Jehol, show fleas armed with various ctenidia on their legs and numerous posteriorly-directed setae (bristles) on their abdomens, indicating highly mature traits. From the same strata, a number of mammal species have been described, the flea fossils are suited to feeding off animals covered in fur or hair. The long siphon seen on some flea fossils . . . could be used to pierce the skin of feathered dinosaurs. This new Chinese study may shed light on an amazingly fossilised insect found preserved in the soft mud of an ancient Mesozoic lake in Russia. 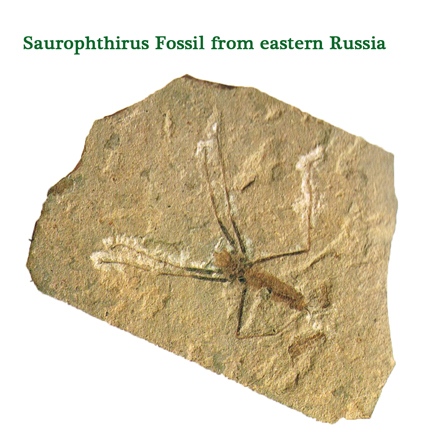 A 2.5cm long fossil of an insect was discovered in the Cretaceous aged rocks of Transbaikalia (eastern Russia). This creature had no discernible wings, long legs with hooks on the end and a distended mouthpart, like a long proboscis. The body was soft but could have expanded considerably in size, perhaps as a result of feeding on fluids such as blood. The creature was named Saurophthirus longipes. It has been suggested that this insect specialised in feeding upon the blood of Pterosaurs (flying reptiles), a sort of ecological niche similar to that occupied by the bat fleas that feed on bats today. Professor Huang Diying and his colleagues suggest that S. longipes may have been a specialised flea, highly designed to a life feeding on reptile aviators. The Jurassic aged fossils may be the earliest evidence of the flea family discovered to date and these fossils taken in context with the Cretaceous aged finds show that Mesozoic fleas readily adapted to feeding on a number of vertebrate hosts, including in all likelihood the dinosaurs.